Photos are illustrative purposes only and may show optional features. These complete two-wheel multi color LED lights with remote will light up your bike like never before with substantial improvements in durability and ease of installation. With this kit, you’ll have everything you need to create outrageous color-changing designs on your wheels – and you won’t have to remove your wheels to install! 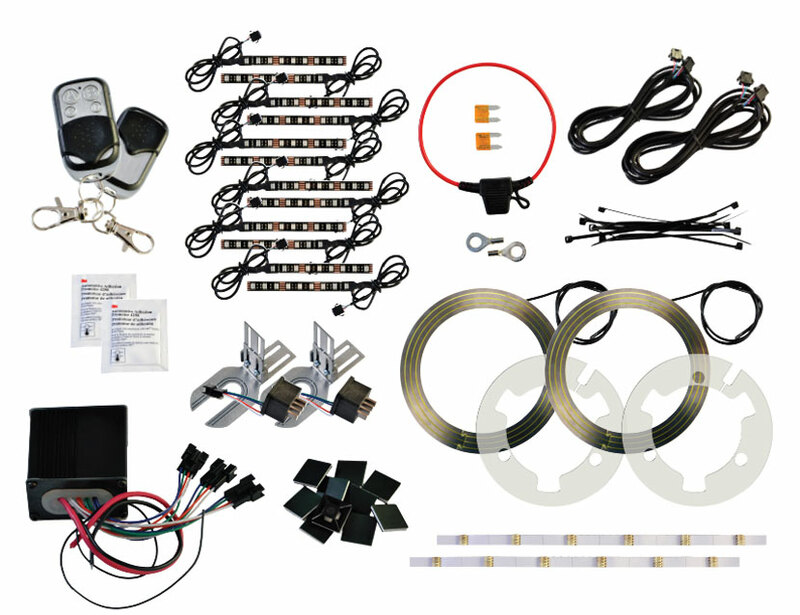 These kits fit almost any motorcycle, and the LEDs are low profile, waterproof and flexible. What’s more, our new EZ-Wiring Backbone makes installation essentially plug-and-play, and all for a fraction of the cost of aftermarket wheels. Don’t hesitate to reach out to us with any questions on these dynamic LED lights for motorcycles. And if you know what you’re looking for, order today!